GATINEAU, Canada, June 18, 2011 - Brazil overcame a serious injury to star player Raphael Oliveira in the third set to defeat the United States 25-23, 21-25, 25-17, 28-26 on Saturday to win the gold medal at the Pan Am Cup men’s volleyball tournament. Oliveira, Brazil’s powerful server, who had scored 12 points before the injury, tore his Achilles tendon and was rushed to hospital where he underwent emergency surgery. 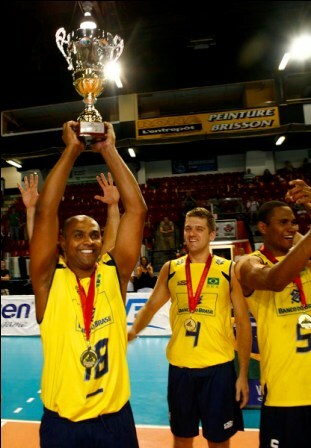 Brazilian legend Anderson Rodrigues came in as a replacement and played a key role adding eight more points. Paulo Silva was the top scorer for the winners with 23 points. Robert Tarr and William Price added 17 points each for disappointed American squad. ‘’This is a great beginning to our preparations for the World Military Games,’’ said Brazil’s head coach Flavio Marinho whose troops were encouraged by a dozen local Brazilians who kept a steady samba-beat drone from the first serve to the winning shot. Final standings: 1. Brazil, 2. United States, 3. Canada, 4. Puerto Rico, 5. Mexico, 6. Venezuela, 7. Argentina, 8. Dominican Republic, 9. Bahamas, 10. Panama.